How To Use The Map: To see what the map has in store, just run your mouse over the place names. If you'd like to see more, click on the link. Whether or not you choose to read the essay below, it is well worth reading at least the paragraph just above the "About The Names" section. Introduction: For travelling Métis up to at least the early 1900s, among whom my own family can be counted, you needed to answer four key questions about the places you went, preferably ahead of time. Whose country would going to a given place take you to? Did you have any relatives there? Did other Métis pass that way or spend time there usually, if you had no relatives there? What about white people, did they have a fort, mission, or town there? If the First Nations were allies but still in a relationship building phase, interactions would be structured by trade and ceremony, each First Nation keeping to its own camp. In a sense, this is what the Great Peace of the Haudenosaunee is. If the First Nations were actively unfriendly to one another, the situation was much more volatile due to mutual raiding. Such situations could exist for longer (e.g. the Dakota-Anishinabe conflict over the Great Lakes region in the 1700-1800s3) or shorter (e.g. the Blackfoot-Plains Cree conflict in the region between Edmonton and Calgary in the early to mid 1800s). On top of these considerations, Métis presence in and of itself could exacerbate or improve conditions, although much of the time it probably changed nothing. Non-Native missions and forts could be seasonally abandoned, or non-Natives could be engaged in their own versions of the four main forms of interaction already outlined among themselves. Returning to the first versions of the questions, this version of the map is labelled quite differently. Instead of the usual contemporary names, all of the places have been relabelled with Native-sourced names in an effort to recreate a sense of what this geography might have looked like in map form if Métis had been making atlases two hundred years ago or so. Clicking on any of the names will open a window providing the answers I found to the four starter questions of a travelling Métis above. About The Names: There are only twenty-three names featured on the different major layers of this website, and a few other names that are mentioned in the information tags besides. Yet even this small sample is highly suggestive of how Métis integrated into an already full land in the early days, and of course shows how I am performing this task myself now. There are many place names that are translations into french* or english** in use by Métis. Cree names may be untranslated or partly translated, corresponding to Michif language practices. Being of French-Cree Métis background myself, these are the names I have favoured. A very few names appear to be Métis coinages of a commemorative type. The best example of these labelled on the map is Bois Mauvaise, "Bad Woods" named for a terrible spring carting trip when the Red and Assiniboine Rivers had flooded so badly that the Métis were forced to cut their way through the poplars, willows, and underbrush in the Brandon area to avoid drowning or losing their goods. These principles certainly apply to the Métis. First develop or in the Métis case learn the names that facilitate your basic survival. Then you develop finer grained names that connect you to the land in detail, binding you to your ancestors, reiterating your history. In time the names are passed on to the youth as they grow up, typically through stories and visiting the places. Throughout Basso's book, Cibecue Elders teach him proper Apache behaviour and Apache history by doing just these things with him. In his own memoirs, Louis Goulet vividly describes a visit to La Cotchille Pilée insisted on by his Elders, who then tell the tragic story associated with the place5. I heard the story of Bois Mauvaise while visiting Brandon in 2009. There are still other names that don't fall into these categories, those of the posts and missions. For example, Fort Aux Liards, or any of the "saint" places like Saint Albert or Lac Ste. Anne. These latter examples are not on the map, which simply reflects that I haven't been to them. So far, I have found ambiguous information about "saint" places. Were these names already used by Métis, or imposed by missionaries later? The second explanation does seem to match, as in Cold Lake you can still hear Métis refer to Lac Ste. Anne as Manitou Lake. Unfortunately, the additional research needed to take this suggestive material and substantiate it is outside of the bounds of this project for the moment. Fort names on the other hand have persisted in Métis usage where the viability of the fur trade persisted until a late date, sometimes even to today. This applies especially to former forts in northeastern British Columbia and the Northwest Territories. There is another mode of Métis place naming argued for by Carolyn Gilman in a 1978 paper, a hypothesis not much considered since. 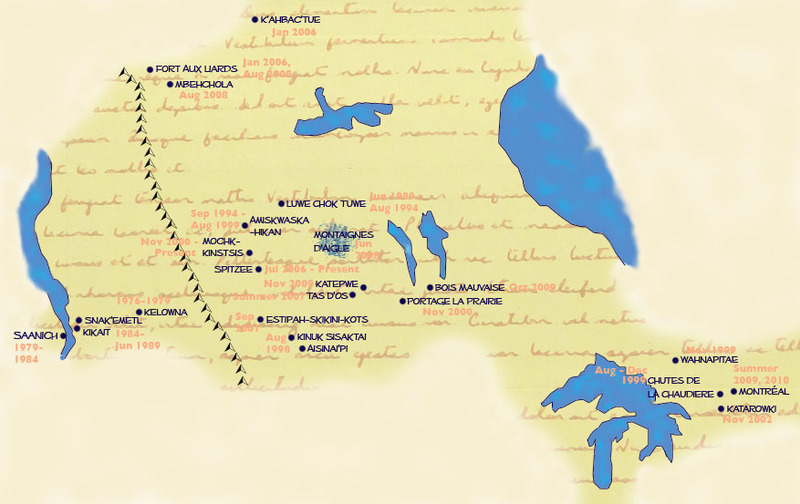 She argued that Métis repurposed voyageur terminology to name new places they encountered, including a whole range of "traverses" and "portages" on the northwestern plains. These names were never applied by non-Métis, especially in Alberta and Saskatchewan, where the canoe was considered a failure for use in the fur trade because the southern Saskatchewan River system is too meandering for canoes to be of much use6. Yet there are named traverses and portages nevertheless, both referring to where it was necessary to unload Red River carts to avoid an obstacle or where it was possible to run carts across a river without unloading them. The original Métis Crossing in Edmonton is an example. The orange text provides the approximate dates when I was in these places, sometimes to live for extended periods, other times on longer or shorter more or less challenging visits.